Argan Oil. 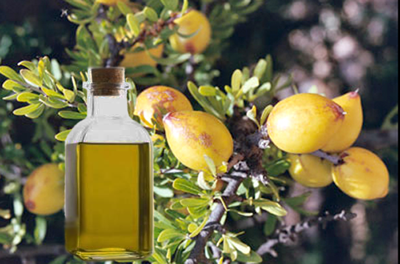 Description, History, Uses of Argan Oil, Nutritional Value and Benefits of Moroccan Oil. Argan oil is a traditional culinary, cosmetic, and healing oil that is produced by the Berber women of Morocco. For hundreds of years, the people of Morocco have benefited from the wonderful qualities of Argan oil. Argan oil gives the user soft skin, reduces wrinkles, heals scars and acne blemishes, softens cuticles, heals split ends, rejuvenates the skin, and acts as anti-inflammatory agent to soothe such conditions as arthritis and muscle aches. Moroccan Argan oil is also rich in Vitamin E and essential fatty acids and is an effective component of a healthy diet. Finally, Argan oil is a natural product and is produced in strict conformity to organic guidelines. It has no chemical additives, and it is safe for anyone to use. Because Argan forests are relatively scarce throughout the world, Argan oil is a prized commodity that sells for a much higher price than other essential oils. In light of this fact, one might question its distinctive worth. Perhaps an understanding of where Argan oil comes from, and the people who produce it, will help put things in a better a perspective. How are Argan nuts harvested and pressed into Argan oil? Argan oil is traditionally produced by the following process: First, the Argan tree nuts are cracked open, and then the fruit of the nut is removed and left out to dry. After the fruit has dried for a while, it is cracked, and the seeds, which are inside the fruit, are removed. The fruit is then roasted and mashed into a water-based pulp. The oil is pressed from the pulp by hand. In recent years, the last two stages – making the pulp and extracting the oil – have been done by machine. This reduces the intensity of the labor for the Berber considerably. 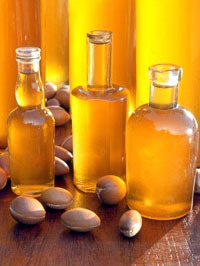 Even so, the production of Argan oil is a truly demanding process. In order to have enough nuts to produce one liter of oil, a Berber woman is required to spend 12 hours cracking the casings open (the casing are extremely hard and resistant to breakage) . During harvest time, the work is very exhausting. Because the work is so difficult, it is especially important that the government insures the workers receive fair wages that compensate them for their hard labor. The entire process of Argan oil is waste-free. All the external components, including the seeds, shells, and fruit pulp, can be used for other purposes, such as feed for cattle, lamp oil, and bread-oven fuel. What can you do with Moroccan Argan oil? Argan oil is traditionally used by Moroccans much like the Italians use olive oil. Primarily it is used for food purposes. However, because of its strong concentration of essential fatty acids and Vitamin E, Argan oil is also an effective cosmetic product. Argan oil is a dark oil with a particularly nutty taste. It is best not used as a cooking oil; rather, it should be used for salads, bread dipping, or other cold uses. There are also traditional Moroccan recipes — such as the recipe for Amlou, a combination of Argan oil, honey, and nuts that creates a sweet butter – like spread — that call for Argan oil. The Moroccan oil is traditionally served with bread at tea times or in the morning, but it is also delicious when used to as a final topping to any grilled or roasted dish of vegetables or meat. Argan oil’s shelf life is not that long, and refrigeration is recommended. If a refrigerator is not available, it is best to store it in a cool place not exposed to direct sunlight. If you store it in your own container, make sure it is not made of transparent material. For cosmetic purposes, Argan oil is used as a skin softener and protectant as body oil. It can also be used to diminish wrinkles, scars, and dryness caused by eczema. In addition, it functions as a topological anti-inflammatory agent and can be used to soothe muscle strain or arthritis. The application of Argan oil in any of the above cases requires only a small amount. It should be applied to the fingers and gently rubbed into the desired area. Argan oil can also be used to restore split ends or reduce dandruff caused by dry skin. The Moroccan oil should be applied and allowed to sit for one half hour, after which it can be washed out. The result is a healthier scalp and a softer head of hair. Like other essential oils, Argan oil can be used in baths, like bath oil and special blends are available for this purpose. Used in this way, it has soothing, calming qualities and will also benefit the skin if the user is careful not to wipe all the oil away when drying off after the bath (in this case, it is best to pat down for the purpose of drying off). As a topical product, however, argan oil has one defect: it contains the comedogenic (i.e., pore-clogging) oleic acid. Because of this, it is advised, as a preventative, that users also keep acne-fighting agents on hand. Argan oil is a way to healthy skin, a healthy diet, healthy lives, and a healthy environment. Buying and using Argan oil is a way to promote skin and bodily health, but it is also a way to support the hard-working Berber women of Morocco and save the diminished Argan forests that are so essential to the region’s prosperity. Argan oil is not simply another healthy product to be used for one’s own personal benefit; it is a product that supports the environment and the sustainable economy of hard-working Moroccan women. To use Argan oil is to give a gift to yourself and a gift to the world. Read more about healthy oils: castor oil, rapeseed oil or canola oil, sweet almond oil, its health benefits, uses in cosmetics, medicine and cooking. This is the first time i’m hearing about argan oil. I would very much like to use this product with my family,and also to support the environment and the hard-working Moroccan women. I am very much interested in your argan products. Thank you for very useful information about argan oil! I try to find some of argan oil products. Maybe you could give me advice where I can buy good quality moroccan oil? Mira’s Hand is bringing the highest grade quality Argan oil to Australia. contact info@mirashand.com.au to find out more. I have used argan oil in hair preparations. We ordered some cold pressed Organic. It felt great in hair oil preparations, where it was just an additive (probably 1 part in 10 of another carrier oil). Sounds as if it’s skin protective qualities are steeped in historical usage in Morocco, especially for the older more sun damaged people who live out of doors. I like the fact that argan oil is organic and a natural product, healthy all the way around. I’d like to buy morrocanoil, I live in Brazil, here is very expensive , Do you seel to Brasil? we have got morrocan argan oil for sale at affordable prices. bit more. I actually treasured each and every single piece of this post. Copyright © 2011-2019. Argan Oil. All Rights Reserved.